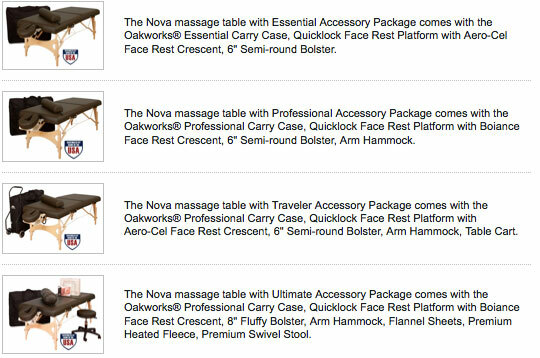 The Oakworks Nova™ Portable Massage Table Package is one of our best Oakworks packages and best sellers in the market. You can choose from three different widths ranging from 29 inches, 31 inches, or 33 inches. Choose the best height that will fit your needs as you have four different heights to choose from. 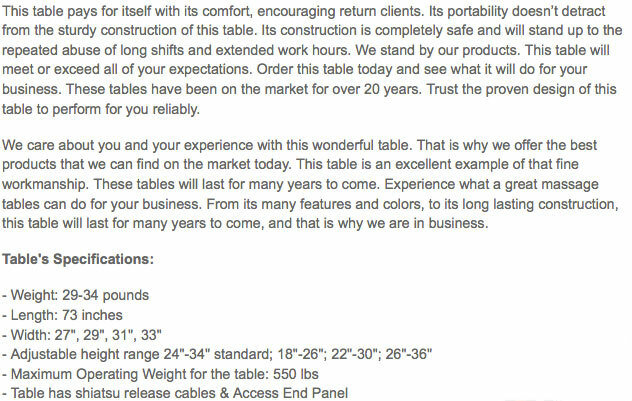 You can get his table as short as 18 inches all the way up to 36 inches. Choosing the best range will make it much easier for your clients and employees. This table comes stock with wonderful plush padding that will make your clients feel comfortable and at home at all times. In addition to the Oakworks Nova™ Portable massage Table you can choose the different variety of Oakworks Nova™ Massage Table packages available. All These packages have been carefully designed and bundled with all the different needs of the massage therapist in mind. * All Oakworks Nova™ packages are shipping free in 48 United States for limited time only. We also have bulk pricing available when purchasing 3 or more packages. Please contact us via chat or phone at 888-515-0444.